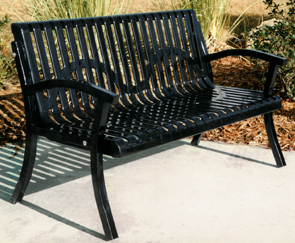 This classic casino style bench combines both comfort and style in one attractive piece of outdoor furniture. 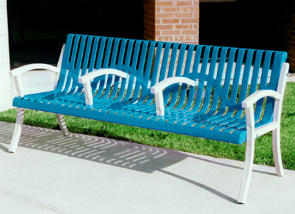 The thermoplastic coated seat and powder-coated frame provide excellent weather resistance. The seat is made from 11 gauge ribbed steel and is finished with lightly textured matte Polyethylene back/seat. Arms and legs are made of 12 gauge 1-1/2" powder-coated steel tubing. Center arms are sold separately and will match your choice of frame color.